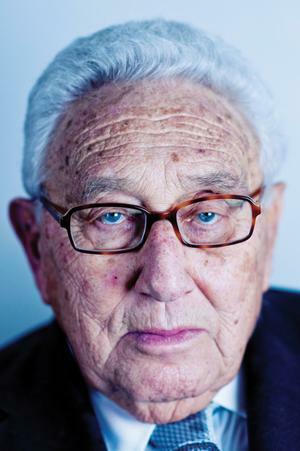 In a recent statement Henry Kissinger admitted that social upheaval and mass civil unrest are to be used as a means of merging the US into an "international system". "Internationally, the problem is that there are upheavals going on in every part of the world, but these upheavals don’t follow the same basic causes, and so the United States has to be part of an international system that we create domestically." What the old man is saying here ties neatly into statements he made in the past concerning the concept of seizing crises and upheavals, the causes of which may differ from nation to nation, in order to bring about an international order- thereby following the elite’s golden rule that order is best brought about by chaos. Furthermore, he provides us with a glimpse of the underlying intent he and his fellow-bilderbergers have in mind, stating in so many words that civil unrest- be it economically, politically or socially motivated- must be seized upon in order to merge nations into the desired "international system." In a December 2008 Prisonplanet.com article it was reported that Kissinger, in an interview with the darling of Bilderberg Charlie Rose, "cited the chaos being wrought across the globe by the financial crisis and the spread of terrorism as an opportunity to bolster a new global order. ", Steve Watson wrote. "I think that when the new administration assesses the position in which it finds itself it will see a huge crisis and terrible problems, but I can see that it could see a glimmer in which it could construct an international system out of it. ", Kissinger told Rose. These words shed some sharp light on the words uttered by Kissinger and his fellow supranationalists, in essence revealing they are very much aware of the fact that the mere proposition of a world state will not make it so- may even backfire on them- and that now a detour should be pursued via nationalism and domestic unrest to get the job done- in other words not so much crushing protests for the sake of crushing them, but rather to use these upheavals for their own transnational designs. "implemented measures (…), taking into account the protection granted to the ECB’s premises and operations by the Headquarters Agreement between the ECB and the Federal Republic of Germany." This makes clear the banking elites of the world are worried their safety may well be impaired as a result of the protests planned against their meetings. The same caution will of course apply to the upcoming Bilderberg conference in Chantilly Virginia. We can expect local police and armed guards to protect the elite players inside, who in return scheme all of mankind into another crisis. And this is reality: "These have one mind;"[shall act in concert as one] "and shall give their power and authority unto the beast. "[Satan, Lucifer, The Beast System].....Revelation 17:13 Holy Bible, Gideons International. "Today I may tell you that our goal is now only a few steps off. There remains a small space to cross and the whole long path we have trodden"(20 centuries per protocol #5), "is ready now to close its cycle of the Symbolic Snake" (i.e. the snake, serpent represents the enlightener of the spiritual by giving mankind the knowledge of good and evil, Satan) "by which we symbolize our people. "Protocol #3, Protocols of the Wise Men of Zion (Scion), Cooper, Behold a Pale Horse, 275.
Who was our Lord the most angry with? The hypocrites(Pharisees) and money changers. If a 12-year-old girl can figure this out, then why can't the rest of us? The bank runs that we are watching right now in Greece are shocking, but they are only just the beginning. Since May 6th, nearly one billion dollars has been withdrawn from Greek banks. For a small nation like Greece, that is an absolutely catastrophic number. At this point, the entire Greek banking system is in danger of collapsing. If you had money in a Greek bank, why wouldn't you pull it out? If Greece leaves the euro, all euros in Greek banks will likely be converted to drachmas, and the value of those drachmas will almost certainly decline dramatically. In fact, it has been estimated that Greek citizens could see the value of their bank accounts decline by up to 50 percent if Greece leaves the euro. So if you had money in a Greek bank, it would only make sense to withdraw it and move it to another country as quickly as possible. And as the eurozone begins to unravel, this is a scenario that we are going to see play out in country after country. As member nations leave the eurozone, you would be a fool to have your euros in Italian banks or Spanish banks when you could have them in German banks instead. So the bank runs that are happening in Greece right now are only a preview of things to come. Before this crisis is over we are going to see bank runs happening all over Europe. Watch Europe closely. When the European banks default and the IMF(International Monetary Fund) does not have enough reserves to cover the losses(give emergency loans) then the banks will collapse leading to more massive "bank runs". Just like Europe the U.S. will probably experience "bank runs" when a new international currency is announced as part of the solution to solve the European debt crisis. Expect a devaluation of the American dollar in relation to the new international currency which will trigger the bank run. If the withdrawals escalate to quickly the Federal Reserve Central Bank may declare a bank holiday preventing further withdrawal of funds. From Alt-Market.com we learn of the globalist elite's plan for the destruction of the dollar which will at some point in time lead to a new world currency. I don’t have to tell most people within the Liberty Movement that this is not going to happen. Unfortunately, there are many out there who do not share our awareness of the situation. Debt implosions and currency devaluation NEVER simply "fade away" they are always followed by extreme social and political strife that tends to sully the doorsteps of almost every individual and family. The notion that we can coast through such a tempest unscathed is an insane idea, filled with a dangerous potential for sour regrets. Stick a fork in er’, the EU is done! We are talking about full scale dismantlement, likely followed by a reformation of core nations and multiple collapse scenarios of peripheral countries. The writing is all over the wall in the wake of the latest election results in Greece and France, where, as alternative researchers have been predicting for some time, the battle between the government spending crowd and proponents of austerity has reached a fever pitch. The Greeks and the French are royally pissed over draconian cuts in public programs and the destruction of pensions which have been a mainstay of their economies for quite some time. They are also furious over being sold off like collateral to the IMF and World Bank. Rightly so. Like the American taxpayer, the taxpayers of floundering EU nations are wrongly being held responsible for the financial mismanagement and fraud of their governments and global banks which have remained untouched and unpunished for their trespasses. The problem is, the voters of both countries are signing on to the socialist/quasi-communist bandwagon in response. In Greece, the Left Coalition Party, a splinter group of the traditional communist party, has now taken a primary position of power. Here is the bottom line; U.S. growth is a theater of shadows. There has been no progress, no recovery, only the misrepresentation of statistics. Millions of Americans have fallen off unemployment rolls because they have been jobless for too long, which lowers the unemployment rate, but does not change the fact that they are still without work. Durable goods orders are dropping like an avalanche. U.S. credit has been lowered yet again by ratings agency Egan-Jones. With China making bilateral trade deals in numerous countries on the condition that the dollar be dropped as the primary purchasing mechanism, and with the EU turning to economic mulch, the currency’s safety is nonexistent. Traditional investors who cling to the idea that a falling Euro spells dollar strength will be sorely disappointed when the currency is suddenly being rejected in international currency markets. The Federal Reserve has already stated that any signs of “relapse” into recession (the recession that we never left) will be met with all options on the table, including QE3. I believe that QE3 will probably be announced this year (due in large part to trauma from Europe), and, that this will trigger a mass movement by foreign nations to drop the dollar as the world reserve. QE3 will be the straw that broke the camel. How exactly this will play out socially and politically, I do not know (I could take a good guess though). But, the technical results are predictable. The Fed will respond to the lack of treasury purchases by ramping up fiat printing in order to cover the ever increasing costs of the government machine. The Greenback will immediately lose a large portion of its value, at least in terms of imported goods, causing inflation in prices. Oil and energy prices will skyrocket if OPEC follows suit (which they will, though the Saudis may still honor dollars for a time). Doing any traditional business will become nearly impossible, and price inflation will dominate the lives and the minds of average unprepared citizens. Our economy has been propped up with bankster bailouts, record low interest rates, and renewed stock market speculation by the 6 mega banks, hedge funds and their affiliates. But this will not go on indefinitely. A day of reckoning is fast approaching. Witness the wild gyrations recently in world stock markets. "Government is not reason; It is not eloquence; It is force! Like fire, it is a dangerous servant and a fearful master. "...George Washington. We MUST reign it in before it turns on its true master - the American people. It is to be our servant not our dictator. We MUST conform it to our wishes rather than have it dictate to us what it desires because tyranny is always the end result. Have you heard the latest outrage? Now the collectivist liberals want to outlaw self defense! just when the American government(DHS) has been arming itself to the teeth for the coming civil unrest when the dollar unravels and gas prices double. "Hollow point" ammunition is never purchased for practice or training. This ammunition is purchased for the sole purpose of being used in active fighting. At the same time, it is a violation of the Geneva Convention to use hollow point ammunition on the battle field. This is enough ammunition to fight a seven year war according to Natural News. Where is all of this leading? I'll answer it for you. Naomi Wolf talks about all of this in her documentary The End of America, where she outlines the 10 steps through which all nations establish a dictatorship. The U.S. government through the Department of Homeland Security is implementing a majority of these ten steps as I type this. After we were hit on September 11 2001, we were in a state of national shock. Less than six weeks later, on October 26 2001, the USA Patriot Act was passed by a Congress that had little chance to debate it; many said that they scarcely had time to read it. We were told we were now on a "war footing"; we were in a "global war" against a "global caliphate" intending to "wipe out civilisation". There have been other times of crisis in which the US accepted limits on civil liberties, such as during the civil war, when Lincoln declared martial law, and the second world war, when thousands of Japanese-American citizens were interned. But this situation, as Bruce Fein of the American Freedom Agenda notes, is unprecedented: all our other wars had an endpoint, so the pendulum was able to swing back toward freedom; this war is defined as open-ended in time and without national boundaries in space - the globe itself is the battlefield. The years following 9/11 have proved a bonanza for America's security contractors, with the Bush administration outsourcing areas of work that traditionally fell to the US military. In the process, contracts worth hundreds of millions of dollars have been issued for security work by mercenaries at home and abroad. In Iraq, some of these contract operatives have been accused of involvement in torturing prisoners, harassing journalists and firing on Iraqi civilians. Under Order 17, issued to regulate contractors in Iraq by the one-time US administrator in Baghdad, Paul Bremer, these contractors are immune from prosecution. Even if you or I are American citizens, even if we turn out to be completely innocent of what he has accused us of doing, he has the power to have us seized as we are changing planes at Newark tomorrow, or have us taken with a knock on the door; ship you or me to a navy brig; and keep you or me in isolation, possibly for months, while awaiting trial. (Prolonged isolation, as psychiatrists know, triggers psychosis in otherwise mentally healthy prisoners. That is why Stalin's gulag had an isolation cell, like Guantánamo's, in every satellite prison. Camp 6, the newest, most brutal facility at Guantánamo, is all isolation cells. Is America Already A Police State?. I'll let Alex Jones answer that for you.